In 2001, Josep Maria Cabané read the book "If this is a man" by Primo Levi, a testimonial book about his experiences as a Jewish survivor of the Auschwitz-Birkenau extermination camp. That reading marked him and led to J.M. Cabané to a deep artistic rethinking, with aesthetic, ethical and political implications in his work, starting an artistic research on the historical memory with an exhaustive documentation on the facts that occurred and the victims of the Nazi and fascist barbarism, especially European Jews and Catalan Republicans. In this artistic project which lasted ten years, J.M. Cabané has developed his pictorial strategy around cartography and linguistic signs, working from drawings, and maps of places of memory (camps and ghettos) and also by writing the name of the victims on the paintings. 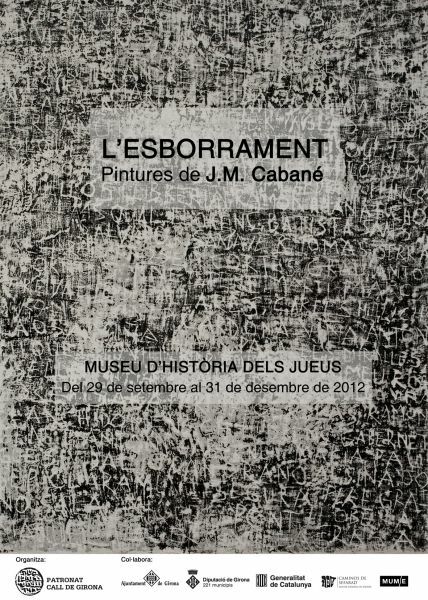 After displaying his project in the Memorial Museum of the Exile of La Jonquera and Arts Santa Mónica of Barcelona, now we present "L'Esborrament", an exhibition showing the series of paintings about the Jewish ghettos (Terezin and the polyptych Ghettos I), concentration camps (Lager) and also "Els noms" series of paintings made with the writing of the names of the Catalans who died in the Nazi camps.